I have not tried the PTI felt yet, but I definitely plan to add some to my next order! I used some felt I had laying around and punched flowers out of it using a Sizzix Bigz die. I added a PTI Raspberry Fizz button to the center. I also used the PTI butterfly die to cut my butterfly, then stamped an image from Butterfly Dreams onto it with Raspberry Fizz. The sentiment is also from Butterfly Dreams, and I attached it to some Raspberry Fizz ribbon using a jump ring. I used the Cute Carton template found HERE for my box, and the dp is from the Cosmo Cricket DeLovely paper pad. Thank you so much for stopping by, and enjoy the hop!!! wow.. this box is something special.. love the bold flower! So cute, Kerri! Love the idea of a big ole felt embellie on a cute little template! What a great gift this will be, love it! Kerri this is wonderful, LOVE the milk carton design and that felt flower is BEAUTIFUL!!!!! Great colors and dp too girl!!! What a pretty box. Perfect to hold a pretty little gift! Very cute. Love the box too! Very cute! Love the box too! Kerri this is a great project. Really sweet! Who wouldn't love to receive a gift in something as pretty as this! What a cute cute box!!! Such a cute box, Kerri!!! LOVE that big felt flower! Very cute!!! The flower completes the cute box, awesome!!! How cute is that! Love the use of the felt on the paper box. Way cute! What a great gift box. Love that big flower and the butterfly is too cute. Good job! Great embellishment for the gift packaging! Cute carton with the felt flower! Love that pattern paper! Cute milk carton what a neat idea for a little gift holder! Love the box!! Stinking cute! This project is so adorable!! Such pretty flowers! What a great project! So pretty! Love your sweet gift box! Such a great project! Love the felt embellishment! This is so cute! I don't have PTI felt yet but have been using some stuff I got at JoAnns. I also flaked out on the PTI blog hop--too busy! Your project is fabulous! This is really cool. 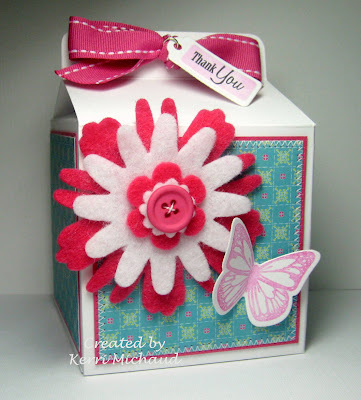 Love the little carton and those bold flowers pack a lot of punch. Great project. Fun packaging! Love the carton box. That's a great box, and the big felt flower is super cute! I can't use felt. The texture of it freaks me out. I'm really strange, I know :) I love the saddle stitch ribbon holding your box shut, and your gorgeous stitched panels. Nice little carton to give away! Cool packaging, love those big, bold flowers! So cute! I just bought a bunch of felt at HL to try before I buy the PTI. The DeLovely paper is so cute stitched on the side. Perfectly little carton in every way!